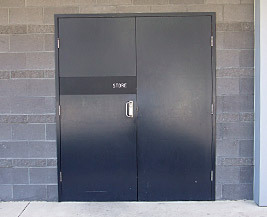 The Squareline Door is a durable all-purpose metal clad door. It is lightweight and is less likely to deteriorate, warp or bind than a timber door under normal and extreme climate conditions. 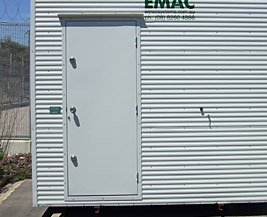 A Squareline door is comprised of a rigid polystyrene solid core clad with Colorbond steel in standard door thicknesses of 40mm. Timber blocks are fitted into the door to allow fixing of hinges, locks and hardware. The side edges of the door have an interlocking seam providing a rivet free, weather proof and aesthetically pleasing finish. The Squareline Door will either open in or out and is also available with an optional exterior grade marine plywood core. Other options include view panels, air relief grilles or door seals. This door is a cost effective, secure and weather resistant alternative to traditional timber doors. Medium security applications including internal doors, perimeter doors, transportable buildings, warehouses, garages, sheds, metal clad buildings and high use doorways. Standard finish is Colorbond steel. Also available is Zincalume, Galvabond, aluminium, stainless steel or with a factory applied durable polyester Powdercoat finish. Doors above this size can be produced using a varied manufacturing process. Door shall be a Lietzke Squareline 40mm thick door leaf comprising a solid polystyrene (or exterior grade marine ply)* core clad with Colorbond steel with an interlocking rivet free edge seam pre-hung in a Lietzke Flange Fit Metal Door Frame (or Lietzke BW Metal Door Frame)*. The door units can be pre-fitted with the locks and hardware as specified.